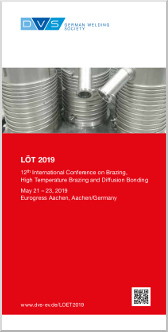 From May 21 to 23, 2019 the 12th International Conference on Brazing, High Temperature Brazing and Diffusion Bonding represents once again one of the world-wide leading conferences in this field. The conference brings together the professional world of joining technology in Aachen. The technical development is still progressing faster and faster. Innovative products are manufactured from most modern materials, which are subjected to extreme conditions both during the manufacturing and in operational applications. Therefore a crucial role is given to the joining technique. Particularly the brazing technique offers a multiplicity of interesting solutions to the manufacturer to join different kinds of materials and products. Even for the application of these joining processes a special level of knowledge is necessary, which results from the application-oriented information exchange of practice and science and mediates the newest realisations. the professional contact between users and researchers can be established or intensified. It is a great pleasure for us inviting all specialists and interested experts to LÖT 2019 to inform about latest developments and trends and additionally to compare the latest findings in international dialogues. Already today we know: LÖT 2019 will be a conference highlight in this year. We would be pleased to see you in Aachen.